This episode certainly had a “end of season” feel to it. Imperfect Circles begins with… Norrie, in a gas mask, waking shirtless Joe up. Wow. Joe McAlister fans on Tumblr were probably squeeing themselves silly. Cut to… Julia and Barbie in bed after they’ve finished their own intimate investigation. This is going to be the most romantic episode of Under the Dome ever. What next? Dodee and Phil? Junior having impure thoughts? We also discover another of the Dome’s powers: pregnant women will experience childbirth with one touch on the Dome. Harriet, a friend of Julia’s, saw a vision of her sailor husband. However, she touches the Dome as she was going to hold his hand giving us our sudden suspense subplot. Alice and Carolyn comfort each other. Dawwwwwwwww. With all the lovin’ that covers all the bases (gay, straight, teen, psycho), Under the Dome should’ve held steady in the ratings. It kinda did according to TVByTheNumbers’ final ratings report. You may have rolled your eyes or shook your head at the love-fest. Under the Dome also brings in much villainy. Ollie has stepped as a Chester’s Mill power player, taking advantage of the fact that water is more valuable than propane. Ollie decided that, hey, if I can control the water, why not control the propane, too? Ollie, now my favorite ambitious antagonist. Big Jim, even at his sneering, slapping, solacing-with-the-bottle best, may be losing his mind that his grand plan, whatever that is, could be falling apart. Big Jim finds that Ollie has his propane supply and changed the locks. Some burly dope is the enforcer preventing Jim from access. Later that night, Jim takes his revenge on the sap by sniping the lug’s truck gas tank. Kaboom! Is that a can of beer flying off the frame? Symbolism? The Dundee brothers are on the loose again for your standard-issue evil-doing. As Julia and Harriet make their way to Alice, the brothers steal gas from Julia’s vehicle. Eventually, Barbie is there and chases the brothers. This leads to a showdown with the Dundees against Barbie, Junior, and Linda. 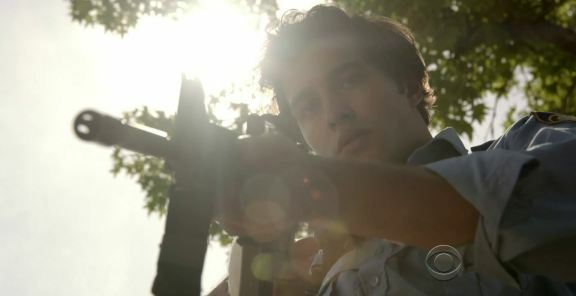 Linda shoots down the first brother. Some time earlier, Junior finds out about the Dundees breaking in Rose’s diner and injuring Angie. With revenge on his mind, Junior fires only two bullets to the last Dundee brother. I expected something more cold-blooded, like Junior squeezing the trigger. I’m still not sympathizing with Junior. The lovebirds are making out with Joe’s back on the Dome surface testing how the Dome will react. Joe then theorizes that if the Dome’s an atom with its surface as an electron then the nucleus must be the source of its power. Oh, Joe. He’s trying to bring in realism and science when the show’s clearing tossing those out the window. The couple, with their dog who I didn’t know about in tow, find the “nucleus” of the dome. It’s an egg-like thing surrounding by its own mini-dome. Norrie then sees a vision of her mother, Alice. That’s Norrie’s impetus to check on her. About the supernatural-sensing dog: I’m having trouble keeping with the human characters. I confused Angie with Maggie for several weeks! Now, I’m supposed to consider how the dog factors into Under the Dome? Anyway, Joe and Norrie are in the McAlister home after Harriet gives birth to her baby, named Alice. See where this is going? Also, CBS, being a network broadcasting over the public airwaves, should have placed a big “Don’t Try This at Home” disclaimer when Barbie cut the umbilical cord with the aid of string. I don’t want idiots “inspired” by Barbie’s heroism. Norrie meets her mother one last time. Break out the Kleenex. Here’s some Lifetime movie-quality stuff going on with the Calvert-Hills being very teary. Good night, sweet Princess Daisy. May flights of angels sing thee to they rest. In other news, Joe finally reunited with Angie, who had stupidly made a previous stop at Rose’s diner (Guess who else was there? ), and Ben, Joe’s skater dude friend who was also at the diner. Norrie went outside and demanded answers from the Dome. The Dome declined to comment about Alice’s death. Though the weird egg thing did respond by having purple sperm run up to its top. All that said, let’s keep ao eye on New Alice, shall we? 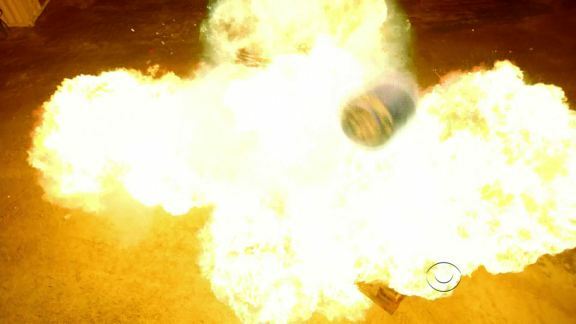 Watch Under the Dome clip: Alice’s tearful goodbye and sperm-on-egg action.